Wow, it's going to another hot blazing day in Baltimore today. Lonnie Spruill was thinking not about the heat of the day. Lonnie's thoughts meandered about an aggressive burn of anger that simmered inside him. 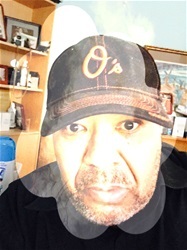 Just Sunday past while he and his close friends John Slade, Frank Coakley, Elias Dorsey, and Webster Lewis headed to church the CBS News announced the bombing of the 16th Street Baptist Church during Sunday School Services. Bombingham, or Birmingham, Alabama had struck with an instrument of cold steeled hatred that permeated through that southern city white populace for centuries. Now just as the nation seemingly was moving towards a hoped for somewhat peaceful resolution of black civil rights this act of terror had struck at the moral fabric of America. To Tink, Spanky, Lonnie, Web, and Lonnie this was just been too damn much. What had these 4 little girls done to anyone? What was their crime against humanity? Why did white people feel threatened by these girls? They had been discussing doing something as a group to have their voices heard but they didn't feel that joining the current fraternities on campus were the answer. You see they felt that as Black Men being ridiculed in public to pledge an organization was just putting lighter fluid of a keg of anger. They were already ridiculed by the majority race for simply being of a darker hue. No way would these brothers face ridicule from men of the same hue. They had run into a number of similarly minded brothers over this past summer during the trip to Washington DC on August 28, 1963, participate in the Jobs and Freedom Rally at the Lincoln Memorial. They heard a Black Minister from Atlanta speak of a Dream, His Dream was the Dream for the Ages a Dream of Equality of the Races. Wow, it was impressive to see the hues of people from all backgrounds saying enough was enough! They ran into Charles Brown, Charlie Briscoe, and Charles Gregory while at the March. The 3 Charlie's were just as interested as them on making a difference and addressing the rights of their people. They also had the opportunity to meet Barron Willis whose parents instilled in him the tools of demanding change. You see Barron, Johnny, Lonnie, Elias, Johnny grew in homes where social change was served with the meals at breakfast, lunch, and dinner. They all had parents who didn’t want to bow any longer nor did they envision any of their sons as anything other than proud, defiant black men. Webster has a genius level of musical talent but he also had determined that he would never allow his dreams to be minimized by society. Being around brothers like Johnny, Bus, Lonnie, and Charlie ensured his focus would never be limited by his skin color. Louis Hudnell wanted to practice law when he left school. Hudnell was a brother who had big dreams for himself. So until he could visualize and materialize his dreams. He felt that being around this group of determined black brothers would allow him to incubate and feed those dreams. Bus Hicks along with the other men wanted to be with aligned with men who were determined to have their voices of racial change heard. Michael Williams had spoken to Barron Willis about this group of independent like-minded men. Mike let Barron, know how he felt. It was like he had found a home with men with designs to create this organization that would look to recruit black men willing to sacrifice to gain power. So one by one man each decided that after classes on September 19th they would meet to draw up some initial plans. It was Albert Hicks's idea to meet out in the open air, not in a closed stuffy room. They wanted to be different so at 5:55 pm on September 19, 1963, 5:55 PM because they all knew that a five-minute jump on change was essential to achieving their objectives. So these 12 dynamic brothers from different backgrounds, states, environments, and interests were going to meet on those historic steps of Hurt Gymnasium. Before the organization had its sacred shield, those five stars, the fraternal hymn, the centaur, or the centaur walk. We had the steps that lead to Edward Hurt Gymnasium. Why did they choose those steps of that particular building and not the steps of Holmes Hall? The steps of Holmes Hall are more identifiable with Morgan State’s campus. Well, you first have to understand that these men sought to be Black Men of Excellence, they sought to be “Absolute Black Men of Honor and Pride”. 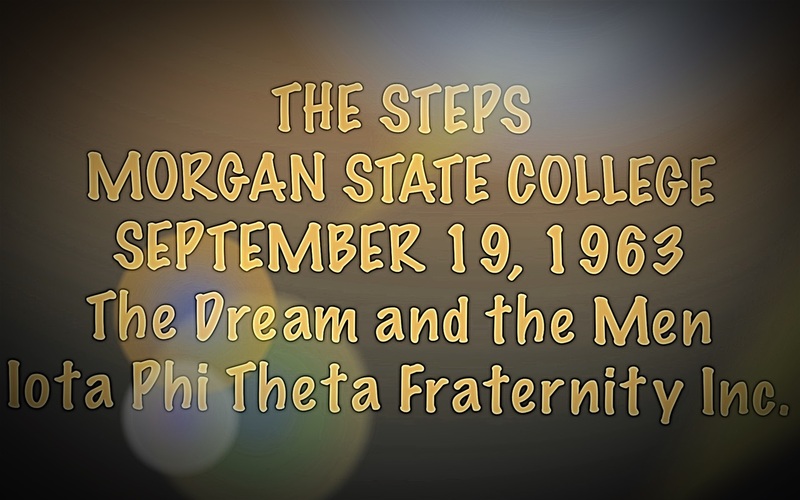 What person from Morgan State’s grand history best exemplified the spirit that these twelve men wanted to emulate. It was an easy decision for Lonnie Spruill, Frank Coakley, Johnny Slade, Charlie Briscoe, Charles Brown, Charles Gregory, Webster Lewis, Albert Hicks, Elias Dorsey, Barron Willis, and Michael Williams to make. That individual was the incomparable Coach Edward Hurt. Coach Hurt preached black excellence and demanded that no Morgan Man would ever bow down to oppression. It was the Morgan Man’s responsibility to seek out oppression and injustice and erase it from each and every black community in this nation. That’s why the steps of Hurt Gymnasium was chosen because Edward Hurt was a symbol of both black manhood as well as black excellence. They forged different life path along the way yet the embryonic ideas established that day still holds firm. That organization is Iota Phi Theta Fraternity Incorporated. The first day was the easiest. All the hard work involved keeping that energy and dream alive despite the naysayers. There would be disbelievers, even a few founders lost sight of what was envisioned. Yet in the end, every one of the initial twelve founders lived to see that dream be nurtured and the organization bloom. This week as we brothers and sweethearts go through our life experiences take a moment to give a thought to Addie Mae Collins, Cynthia Wesley, Carole Robertson, and Denise McNair. Each made the ultimate sacrifice unknowingly stuffed out by terrorist designs. We pay homage to these young girls whose lives were lost and the twelve men with a dream this week, Founder’s Week, Iota Phi Theta Fraternity, Incorporated. Also, please come out on September 19, 2017, at 5:55 pm to the memorial statue that honors our founding and our founders on the campus of Morgan State University’s Hurt Gymnasium. As you walk across campus this week as brothers remember to pay special homage to our Founders and our Fraternity's Founding. Also, remember the steps of Hurt Gymnasium. 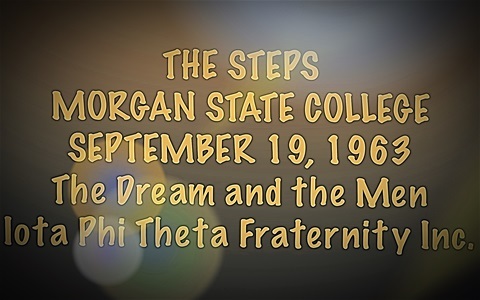 Those steps aren’t the same steps that our founders decided would be a special place of significance for our organization. Yet the spirit of the steps resides in each one of us brothers, past, present, and future. Ole Ole Ole Ole Ole Ow Ow Ow Ow Have a Great Founder’s Week My Brothers.